A RUP LIFE: Treasury of Bible Stories Review & Rhythmical Rhymes Kindle Giveaway! Treasury of Bible Stories Review & Rhythmical Rhymes Kindle Giveaway! 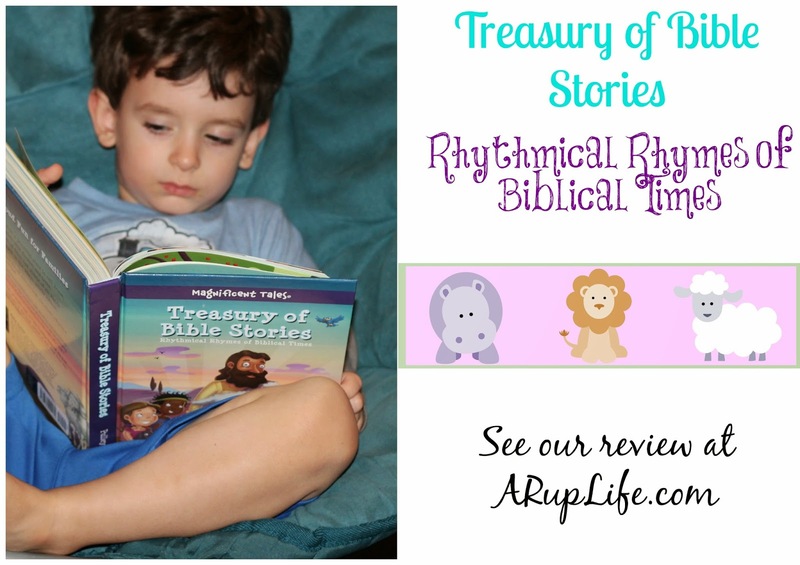 I recently had the chance to review Treasury of Bible Stories: Rhythmical Rhymes of Biblical Times. This is such a delightful book. I've been using it in the mornings to expand on topics brought up in our homeschool curriculum. We've read about Noah and Adam and Eve so far and it is ADORABLE! Totally rhymes like the children's classics from Dr. Suess. I have personally loved the pictures in this book - the characters are adorably drawn and draws my child in for a look. Last time I had children's nursery I brought this book and taught about Noah. We read this story and colored a coloring sheet. So simple and easy to implement! You can purchase your copy of Treasury of Bible Stories - Rhythmical Rhymes of Biblical Times at your local Christian book retailer or online at stores like Amazon. Featuring lyrical stories that will make you laugh, this colorful collection is perfect for reading out loud. Magnificent Tales are rhyming Bible stories with clever art and clear lessons the whole family will enjoy. The stories and illustrations are so engaging that you won’t grow tired of reading a Magnificent Tale night after night! From “The Salty Tale of Noah’s Ark” to “The Lasting Story of the Last Supper,” the rhyming tales in this book remind us that God loves His people—in the Bible and today! Part of the Magnificent Tales series, Treasury of Bible Stories: Rhythmical Rhymes of Biblical Times will delight children ages 4–8 with rhyming Bible stories pairing spiritual truths with playful illustrations.